One the most proven airframe designs in all of Light-Sport Aviation is the T-211 series from Dallas, Texas-based IndUS Avation. In this video of the Thorpedo -- the more powerful version with the Jabiru 3300 engine -- marketing man Scott Severin helps us visualize the changes to make the airplane better accommodate larger occupants. In addition, they have an instrument-training panel that flight schools might find compelling. One the most proven airframe designs in all of Light-Sport Aviation is the T-211 series from Dallas, Texas-based IndUS Avation. In this video of the Thorpedo — the more powerful version with the Jabiru 3300 engine — marketing man Scott Severin helps us visualize the changes to make the airplane better accommodate larger occupants. In addition, they have an instrument-training panel that flight schools might find compelling. Made in the USA, the IndUS Thorpedo is a storied American design (hint: the 1950s version was the predecessor to the Piper Cherokee). Now the Texas company builds it with the potent 120-hp Jabiru 3300 to make it a performer designer John Thorp never envisioned. This all-metal design has the mmost interesting wing structure among SLSA. 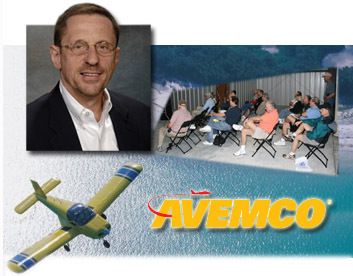 Avemco advises LSA producers could help contain insurance premiums by... solving any design issues; doing better transition training of pilots not used to light wing loading; getting more shops ready to do repairs and assuring replacement parts are available; and, working with aviation experts to properly value used aircraft and those in salvage operations. Similar tasks are required for all new aviation market segments. Does FAA control aviation? They regulate it (sometimes well). True control may be in the hands of insurance companies. Just try to operate your airplane, your airport, your aviation business without insurance coverage. Insurance companies help keep airports open and protect our investment in airplanes when we occasionally land a bit hard. *** One company addresses market needs differently. Avemco sells directly to pilots, not through middlemen. This may explain why Avemco is one of the country’s largest airplane insurers. *** Their top man, Avemco President Jim Lauerman, has been out doing his homework on LSA. In our conversation at Sebring 2008, Jim told me about all the LSA leaders he spoke to at the event. Following Sebring he went quite a few extra miles and paid in-person visits to AMD, American Legend, and IndUS Aviation. *** Since Lauerman is personally willing to look carefully at LSA, industry players are likely to heed his advice out of respect for his interest and thoroughness. Rules for Light-Sport Aircraft allow plenty of room to experiment and IndUS took advantage with their new Thorpedo DP. The three cylinder engine is turbocharged and supercharged to produce 120 horsepower. Sun 'n Fun has been a rip-roaring success for Light-Sport Aircraft. The new LSA Mall right at the main entrance gate has been thick with traffic all week and even the weather cooperated after a day-before-opening deluge of rain (5+ inches in a few hours!). In the days ahead, I'll have lots more LSA news for SPLOG readers. *** On Saturday, IndUS Aviation unveiled their first-in-the-industry diesel-powered Thorpedo DP. News media and interested parties turned out to hear IndUS leaders speak about the project. The Dallas, Texas-based company finally pulled back the curtain after months of work to reveal their WAM-120 three cylinder, two-stroke engine tucked neatly under their new shapely nose cowl. *** Turbocharged and supercharged, the 120-horsepower engine burns a mere 3 gallons of Jet A per hour. This fuel is widely available around the world (important to an international seller like IndUS) where 100LL is not. According to IndUS president Ram Pattisapu, "[The WAM-120 is] quiet and has unbelievable climb performance." *** ASTM has a compression engine standard for diesel engines; IndUS is the first to use it and is presently pursuing certification of the Thorpedo DP. They expect to offer the aircraft for sale by AirVenture Oshkosh 2008. Sun ‘n Fun has been a rip-roaring success for Light-Sport Aircraft. The new LSA Mall right at the main entrance gate has been thick with traffic all week and even the weather cooperated after a day-before-opening deluge of rain (5+ inches in a few hours!). In the days ahead, I’ll have lots more LSA news for SPLOG readers. *** On Saturday, IndUS Aviation unveiled their first-in-the-industry diesel-powered Thorpedo DP. News media and interested parties turned out to hear IndUS leaders speak about the project. The Dallas, Texas-based company finally pulled back the curtain after months of work to reveal their WAM-120 three cylinder, two-stroke engine tucked neatly under their new shapely nose cowl. *** Turbocharged and supercharged, the 120-horsepower engine burns a mere 3 gallons of Jet A per hour. This fuel is widely available around the world (important to an international seller like IndUS) where 100LL is not. Painted in a more conventional, but tasteful, scheme, this Thorpedo shows the smoother lines of the LP series from IndUS. The nose cowl was radically resculpted and the wing tips were dressed up for night life. IndUS marketing geniuses called their program "Refresh '08," but perhaps it ought to be "Renew '08?" The changes on which IndUS staffers have long labored gave the proven design its smartest look yet. Here's a neat trick for what may be the oldest SLSA design in the fleet, what with Serial Number One T-211 turning 61 in 2007 ("and it's still flying all over the place"). 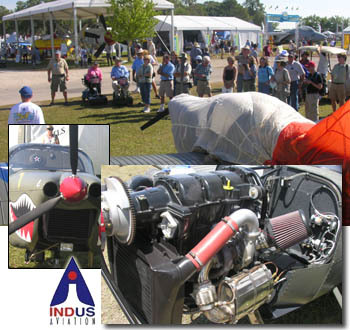 *** In January 2007, IndUS announced a partnership with LoPresti, the Speed Merchant people who helped Piper and several other GA brands extract more performance from their airplanes without airframe modifications. IndUS left the partnership but a clever team at the Dallas company took up the innovation effort and produced impressive results. 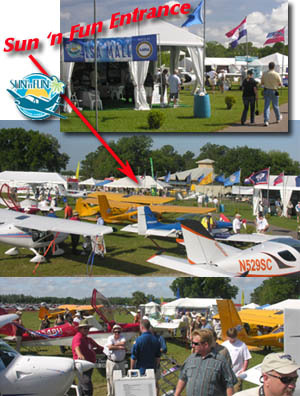 *** The Thorpedo shown at Sebring 2008 sported a snazzy new engine cowl treatment, light-emitting wing tips including built-in landing lights, and streamlined gear leg fairings. Comfort factors included renewed boarding steps and seats lowered to accommodate tall pilots. IndUS has been pushing to improve fit and finish and the fleet the Texans brought to Sebring were the best iterations I've seen for this venerable design -- which back when led to the Piper Cherokee series (do you see the familiarity?). IndUS marketing geniuses called their program “Refresh ’08,” but perhaps it ought to be “Renew ’08?” The changes on which IndUS staffers have long labored gave the proven design its smartest look yet. Here’s a neat trick for what may be the oldest SLSA design in the fleet, what with Serial Number One T-211 turning 61 in 2007 (“and it’s still flying all over the place”). 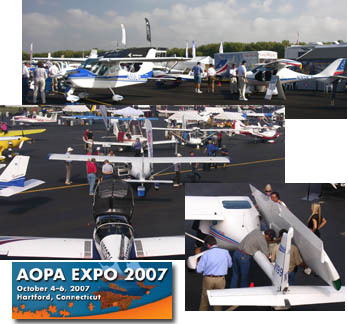 *** In January 2007, IndUS announced a partnership with LoPresti, the Speed Merchant people who helped Piper and several other GA brands extract more performance from their airplanes without airframe modifications. IndUS left the partnership but a clever team at the Dallas company took up the innovation effort and produced impressive results. *** The Thorpedo shown at Sebring 2008 sported a snazzy new engine cowl treatment, light-emitting wing tips including built-in landing lights, and streamlined gear leg fairings. IndUS wants you to imagine you're flying the lead Thorpedo of four sold at the Sebring LSA Expo. You'll have to go to the show to make that happen. Welcome to a new year for LSA! We're barely two weeks away from the season-launching Sebring LSA Expo. As 2007 ends and companies prepare for 2008, new models will be on display at Sebring and upgraded versions will further entice consumers. Among the latter are two refreshed models from Texas-based IndUS Aviation. *** Marketing man Scott Severen sent a long list of alterations made to the all-metal Thorpedo LP120 and LP85. They incorporate IndUS-completed aerodynamic refinements (new engine cowl, wing tips, and gear leg fairing) plus canopy styling and wear improvements, new boarding steps, new lowered seats for taller occupants, electrical system upgrades plus several interior or ergonomic refinements. Other updates focus on comfort and safety. It shows IndUS has been listening to customers and acting on that knowledge. *** Severen says IndUS will be at Sebring with no less than 8 aircraft. And bringing this fleet allows IndUS to make an unusual offer: Upon completion of signed purchase order and a $5,000 deposit, the aircraft of customer's selection at the show will be flown free of charge to the customer's home airfield by one of Severen's sales team. IndUS will have four airplanes for immediate delivery under what they're calling the "Show and Go" program. Prices range from $75,000 to $132,000. We’re barely two weeks away from the season-launching Sebring LSA Expo. As 2007 ends and companies prepare for 2008, new models will be on display at Sebring and upgraded versions will further entice consumers. Among the latter are two refreshed models from Texas-based IndUS Aviation. *** Marketing man Scott Severen sent a long list of alterations made to the all-metal Thorpedo LP120 and LP85. They incorporate IndUS-completed aerodynamic refinements (new engine cowl, wing tips, and gear leg fairing) plus canopy styling and wear improvements, new boarding steps, new lowered seats for taller occupants, electrical system upgrades plus several interior or ergonomic refinements. Other updates focus on comfort and safety. It shows IndUS has been listening to customers and acting on that knowledge. *** Severen says IndUS will be at Sebring with no less than 8 aircraft. And bringing this fleet allows IndUS to make an unusual offer: Upon completion of signed purchase order and a $5,000 deposit, the aircraft of customer’s selection at the show will be flown free of charge to the customer’s home airfield by one of Severen’s sales team. IndUS Aviation builds the Continental-powered T-211 and the Jabiru-powered Thorpedo at Dallas Executive Airport. The company is also active in establishing LSA in India (hence their name, Ind-US). Some folks wonder about the new Statement of Compliance to ASTM standards. Is this a true certification system? FAA doesn't do the certification, so how do we know it means anything? Good questions. A manufacturer certifies their airplane. A Designated Airworthiness Rep (DAR) examines it. Companies behind each approved SLSA (now 38 aircraft) must also do an annual internal audit. Now industry association LAMA has started promoting voluntary independent audits, to be certain a design has met and still meets ASTM standards. The first of these was performed and today LAMA was advised that IndUS Aviation, maker of the Thorp T-211 and Thorpedo, successfully completed the first external audit of a LSA builder. LAMA president Tom Gunnarson called IndUS, "an accredited company." Such third-party audits -- plus a proposed decal applied to every aircraft showing successful completion -- is likely to win support from EAA, AOPA, insurance companies, FAA, and NTSB. Buyers may soon learn to look for the "Seal of Approval." Some folks wonder about the new Statement of Compliance to ASTM standards. Is this a true certification system? FAA doesn’t do the certification, so how do we know it means anything? Good questions. A manufacturer certifies their airplane. A Designated Airworthiness Rep (DAR) examines it. Companies behind each approved SLSA (now 38 aircraft) must also do an annual internal audit. Now industry association LAMA has started promoting voluntary independent audits, to be certain a design has met and still meets ASTM standards. The first of these was performed and today LAMA was advised that IndUS Aviation, maker of the Thorp T-211 and Thorpedo, successfully completed the first external audit of a LSA builder. 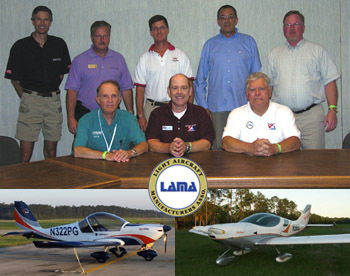 LAMA president Tom Gunnarson called IndUS, “an accredited company.” Such third-party audits — plus a proposed decal applied to every aircraft showing successful completion — is likely to win support from EAA, AOPA, insurance companies, FAA, and NTSB. PATRIOTIC SKOOTER - All red, white, and blue with a bright red interior makes the Sky Skooter an all-American bird. FULL CONTROL - Great for teaching in, the Sky Skooter duplicates controls at each seat. The trim wheel on the left side of the center console can't be seen from the right seat but is easily adjusted. SMILIN' BOB - Who wouldn't smile? Bob Widmer's task is to fly the Sky Skooter to and from the Texas home base and to keep the bird in the air at airshows. OPEN & CLOSED - The sliding canopy on the Sky Skooter is an endearing quality to ultralight pilots. You can open and close this canopy anywhere in Sky Skooter's flight envelope. RED IS RIGHT - In a bright Florida sun, this interior positively glowed. Fully finished interior panels with ample map pockets flank leather seats. DETAILS, DETAILS - To soften and smooth the stall pattern, this leading edge strake was added. A larger one allows air leaving the trailing edge to do so with much less form drag. COWL VIEW - What you can see is the Sensenich-brand wood propeller and the cooling fins of the Jabiru engine. What you don't see (it's on top of the cowl) is the "hood," a large access port to allow you to inspect and work on the engine. EXTERNAL RIBS - With only two internal ribs (plus a root and tip rib), Thorp made his wing easy to build with this external ribs design. This helps keep the plane lighter while adding to low-speed handling qualities. TAIL VOLUMES - John Thorp knew a thing or two about tail size to create a good handling airplane. Part of the reason for the Sky Skooter's agreeable handling is this empennage. STOUT NOSEWHEEL - Students, take note. You won't be stressing this robust nosewheel as you learn the art of landing an airplane. Wheel pants can be fitted for private owners. he proven airframe and modern panel of the Sky Skooter make perhaps the oddest, yet most appropriate of mates. Each from a different age - the T-211's unique ribbed wing beckons from the 1940s while the ePod streaks ahead in the 2000s - they nonetheless complement each other. 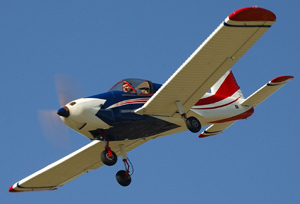 The Sky Skooter is the fun little variant of the T-211 series, including the FAA-certified T-211 and the ASTM standards-compliant (LSA certified) Thorpedo. The company can deliver just about any version of John Thorp's groundbreaking design, the very one that lead to Piper's Cherokee, which sold tens of thousands. Complementing the joyful and innocent Sky Skooter with the most pleasant in-flight handling comes the visitor from the future: IndUS Aviation's ePod. Putting these together for a flight review shows the past and the future of light-sport aviation. Long Perspective The T-211 has a long, rich aviation history. The model dates back to designs studies in the early 1940s that lead to the Lockheed Little Dipper, a single-place light aircraft created by legendary designer John Thorp. This work later led to a 2-seat pusher called the Big Dipper. By 1945, this plane had evolved to the Sky Skooter, a 65-hp Lycoming O-145-powered aircraft that earned its CAA Type Certificate as a normal category aircraft (the Civil Aviation Authority was the predecessor of the FAA). By the early 1950s, the Sky Skooter had acquired a 90-hp Continental C-90 engine. As it developed and evolved, the T-211 led to the 180-hp preliminary design for the Piper Cherokee in 1956. That storied company eventually built the PA-28 Cherokee with 150 hp. Thorp's work influenced other designs as well, such as the 2-place, twin-engine Wing Derringer, which began life as a twin-engine version of the Skooter. Thorp's prolific design work led to the T-18 that became popular among homebuilders. In 1960, one of the all-metal, 2-place, high-performance models built by Don Taylor became the first homebuilt to fly around the world. In 1963 the Sky Skooter Type Certificate was amended to provide for a 100-hp Continental O-200. This was design designation T-211 for John Thorp. One of the most distinguishing characteristics of the airplane is the ribbed wing design, a feature also found on other aircraft in the WW II time frame. The ribbing is also found on the horizontal tail surface, which is an all-flying stabilator, advanced for its day. When a Texas surgeon named Ram Pattisapu, who was born in India, formed IndUS Aviation in '94, he also formed a working partnership with Taneja Aerospace and Aviation, Limited (TAAL) of Bangalore, India. TAAL builds T-211 airframes and ships completed airframe subassemblies for American sale to IndUS Aviation at Dallas Executive Airport in Texas.1 In 2005, IndUS Aviation added a foot of span and 10 more square feet to the wing, in my experience nicely contributing to a reduced landing approach speed. The advantage of the ribbed aluminum wing and horizontal tail is that this construction saves a lot of interior riveting as far fewer internal ribs are used. The wing forms a sort of external structural rib, greatly easing the assembly process. One other popular feature of the Sky Skooter is its sliding canopy. Of designs using this entry means, few can fly with the canopy slid back. The T-211 can do so any time the occupants desire. Ultralight pilots might enjoy this configuration for local flights in pleasant weather; I know I sure did. Cozy Cabin Inside the Sky Skooter cabin, you'll see a deluxe general aviation-style appointments including a fully finished interior of leather seats, carpeted floors and a fully finished interior, plus four elastic-banded stash pockets for aircraft logs, sectional maps, and other items you may want in flight. Behind the seats is a luggage area that can hold 80 pounds of gear, though you won't be able to reach many of these items in flight. Contrasted with some of the more spacious light sport aircraft, the Sky Skooter is a relatively snug-fitting cockpit, about an inch wider than a Cessna 150. Two large fellows may not fit inside comfortably, though average-sized occupants will find adequate elbowroom. The Sky Skooter's flap lever is mounted forward of a centrally mounted hand brake lever. A detent button is used only to release the flaps; flaps deploy automatically as you pull aft on the easily accessed lever. Forward of the brake lever is the fuel shutoff. Two notches of flaps are available, deploying to approximately 15° and 30°. Originally the flaps had a 45° down setting, but that proved to be more than is necessary and it was modified later. A trim wheel is just to the left of the center console; both occupants can reach it easily but the right-seat occupant can't see the setting easily. Each seat has a joystick comfortably positioned between the occupant's legs. A Dynon flight instrument and the ePod face the left-seat occupant with power switches and key electric starting on the far left of the instrument panel. Near the center of the panel are engine throttle, choke, and the carburetor heat control. The occupant in either seat can reach these without a stretch. Both sides have headphone connections and fresh air controls. Both seats have rudder pedals but the center-mounted hand brake is unidirectional. Easily operated from either seat, the hand brake affords good leverage with adequate stopping power and this configuration is familiar to ultralight pilots. General aviation pilots used to braking with their toes or heels may have some relearning to do, though IndUS Marketing Director Scott Severen observes that many Piper airplanes used a hand brake. Sky Skooting After going aloft with my checkout pilot, Bob Widmer, and given my experience with two other T-211 models (the Continental-powered T-211 and the 120-hp Jabiru 3300-powered Thorpedo), I felt comfortable enough to try a few landings. All three landings I performed in the Sky Skooter turned out well. I found the 85-hp Sky Skooter flew much like an ultralight in that you need to assure adequate speed to retain energy for the landing flare phase. During 2005, IndUS Aviation added to wingspan and area - 10 more square feet came at the wingtip growing the wing to 115 square feet. This helped lower the stall speed from the earlier models and extended the flare window. So, I approached at around 50 knots (57.5 mph) indicated where earlier I'd been advised to approach at 70 knots (80.5 mph). The faster speeds were rather conservative, perhaps, but the extended and enlarged wing clearly allows you to bring in the Sky Skooter somewhat slower, which will be helpful at short, unimproved airstrips. I found that using the first notch of flaps on landing didn't accomplish much. In fact, most T-211 pilots don't use any flaps. You definitely don't use any flaps for takeoff, as you'll only add drag. According to IndUS Aviation, the Sky Skooter can take off in approximately 350 feet, a clear benefit to using the small Jabiru engine that is about 150 pounds lighter than the Continental. This lesson again proved to me that lightening an airplane could be valuable, as less power is needed to perform some of the same functions. The Sky Skooter can land in an equally short distance so it should feel right at home at most ultralight airparks. With generous clearance afforded by its main gear and nosewheel, you won't worry about turf runways at all. The Sky Skooter can be fitted with wheel pants, but they will tend to restrict you to smoother landing surfaces. Love the Handling All the T-211 variants, including this Sky Skooter, will impress most pilots. Well-harmonized controls are very light to the touch without being sensitive. The roll rate is not particularly fast but the Sky Skooter's well-engineered linkages make handling light and pleasant. John Thorp designed control pushrods and bell cranks with ball bearings throughout, and it shows when you move stick and pedals. The Sky Skooter executed beautiful steep turns. I did 60° steep turns for two full turns and found it easy to keep the ball coordinated. That's not something I've found true on many light sport aircraft, which tend to require more input than the Sky Skooter. To me, this suggests good applicability of the Sky Skooter to training applications. Not much back stick was required to hold altitude, and adverse yaw was minimal. I also found power-on and -off stalls to be very mild. In several trials, I found no stall showed any tendency to fall on a wing. Neither did they show the slightest tendency to break over. IndUS Aviation sales literature states, "Stall resistant. Spin proof." I didn't explore spins without a parachute on board, but I can attest to the stall resistance. I think you'd have to push very aggressively to get the Sky Skooter to misbehave. I performed power-on stalls at full power, power-off stalls entered gently much more aggressively, plus I did accelerated stalls. In every case the Sky Skooter showed very benign characteristics. Power-on stall occurred at below 45 knots (51.8 mph) indicated while power-off stalls occurred at around 50 knots (57.5 mph) indicated, though IndUS Aviation literature states 43 knots (49.45 mph). While at cruise altitude, I measured the descent rate at 700 fpm over a 2-minute timed descent. This is mid-range among all light sport aircraft I've flown and comparable to many ultralight designs. Though my landings were reasonably good, I did plop the airplane on the ground once. Regardless of my technique, the Sky Skooter's tough gear absorbed the load as though it were nothing. Flight school operators will love this airplane, as will their students. On our first go-around, I noted rotation came at about 50 knots (57.5 mph) indicated airspeed. Recreational Performance Thanks to its lighter weight ­-­ and perhaps because Bob and I flew somewhat under maximum takeoff weight ­- the Sky Skooter enthusiastically left the ground in only 350 feet of roll. IndUS Aviation provided the measurement I couldn't take and I've found their brochure figures to be honest. Though the lower-powered model lacks Thorpedo's robust performance (with the 120-hp Jabiru), I was able to record climb rates of 700 fpm for the first 500 feet or so of climb. As altitude rose, that figure backed off to about 600 fpm, still better than the Continental-powered T-211 model I'd first flown. Though I know the theory, I admit to being rather amazed at the results of removing about 150 pounds by switching from the Continental to the smaller 80-hp Jabiru 2200. In addition to performance, useful load shoots up to a whopping 645 pounds. This is sufficient to carry full fuel (21 gallons), two 200-pound occupants with all allowed 80 pounds of luggage, and still leave the little plane 39 pounds under gross. The little Jabiru engine ran beautifully, a credit to IndUS Aviation's mechanics as they installed this engine. But it also speaks to the design of the Australian-built engine. In my experience, the Jabiru 2200 seemed to run best at around 2,700 rpm. Maximum continuous power has recently been raised to 2,850 rpm where cruise maxes out at 115 mph, IndUS says. Jabiru USA representatives say the Australian engine prefers to run 2,700 rpm or higher. The new maximum continuous power setting is 2,850 rpm. Yet based on noise and vibration I tended to set power lower, typically 2,600 rpm. IndUS Aviation says that setting offers a very economical flying speed, burning less than 5 gallons an hour. Given 21-gallon fuel tanks - the same as a Cessna 150 - the Sky Skooter can run better than 4 hours, a good duration that flight school operators and recreational pilots can both appreciate. The Sky Skooter isn't meant to be the fast light sport aircraft in the fleet. At full power in level flight, the 85-hp model can hit 115 mph, though a more normal cruise speed is able to settle right at the century mark. Greater speed can be coaxed from the design for recreational pilots interested in faster cross-country flying. One obvious way to achieve this is to add wheel pants. IndUS Aviation plans a more subtle solution like adding a small fairing at the trailing end of the canopy where an inch gap generates a bit of drag. But in truth, the Sky Skooter isn't about maximizing speed. In a training environment 100 mph is plenty and for many fun flyers, that $100 hamburger tastes just as good - maybe even better - if it takes a few extra minutes to arrive at your destination. ePod Information Center Apple Computer is making millions with their iPod, so why shouldn't aviation have an Engine Performance Observation Deck (ePod)? With this modern device IndUS Aviation introduced an interesting new information system to light sport aviation. Other companies offer electronic engine monitoring systems. Some have bright, colorful graphics, larger screens and more compact panel mounts. Yet IndUS Aviation's ePod has several features no other engine monitoring system has. I asked IndUS Aviation Marketing Director Scott Severen to highlight the top qualities of ePod. He says ePod basically does three things for you. First, it gives you real-time information on your engine. Second, it provides a record of engine parameters that may be useful for mechanical diagnostics useful to routine maintenance and problem solving. Third, it is a form of logbook, carefully chronicling each flight in a meticulous way that is hard to match with hand-written entries in a logbook. "Our ePod is a data recorder," Severen elaborates while emphasizing that it is a "plug and play" unit that requires no programming. He refers partly to the ePod's preloaded data to serve 100 different engine models. Some other brands may accomplish some of these same results but require a laborious and iterative data entry and adjustment process. But Severen reflects on the simplicity built into their capable instrument. "We're aware that too many VCRs around the country continuously blink '12:00' because most folks feel daunted by programming a video recorder," Severen says. He wanted the ePod to be much easier to use so they preprogrammed the ePod with more than you'll ever need. If they somehow missed something, the ePod can easily take on new information that IndUS Aviation can send you via e-mail. "We offer updates and diagnostics sent electronically to owners and we can add features by this same means," says Severen. The ePod comes with PodStick, a Memorex USB thumb drive that you use to transfer information from your computer to your ePod. It works both ways, of course, allowing a mechanic to download the engine's history for analysis on his computer. Using the ePod is also simple, thanks to clearly labeled and lit buttons that quickly take you to the information you seek. Those buttons are widely spaced, allowing use in turbulence or while wearing gloves. "The ePod screen rotates every 3 seconds, effectively doing your scan for you," Severen continues. He notes that the center of the screen is where this occurs with both sides constantly showing you some basic facts: time, engine power setting and percentage, fuel on board and fuel usage. At any time, you can hit a button and immediately see a certain piece of information. After a few seconds the ePod will resume its regular scan of engine performance. Acting intelligently the ePod offers alerts like some other devices, but it doesn't merely blink at you. The particular button reflecting the area of concern blinks, and the screen changes to that function, asking you to check the parameter and an audio alarm also sounds, though the latter can be turned off. "Our ePod is simple up front," Severen explains, "though what's happening behind the screen display is quite sophisticated." He adds that while the ePod records data, it also considers what's happening, analyzing information as well as capturing it. For example if fuel flows and fuel volumes don't match up, it might help you discover that you have a fuel leak. Imagine how reassuring that might be while flying cross-country at night. The screen is "transflective," meaning that it actually improves in sunlight when some instruments become unreadable. When the light dies, the ePod is automatically backlit. In this description of the ePod, I've only scratched the surface of this interesting and impressive instrument. I recommend you go to IndUS Aviation's completely redesigned Website and check out the large amount of information available. The technically inclined among you will find much to study. After hearing all of Severen's descriptions of the ePod, I felt the device seemed to be the aviation equivalent of the medical smart card, those credit card-like tools that can hold all your essential information to assure health workers have your critical information. For an aircraft, the ePod's amazing ability to know the engine's history - it can hold 5,000 hours of information, enough for more than two overhauls, says Severen - will permit a trained mechanic to very accurately analyze what has happened to your engine since the day it first started. Putting It Together Familiar joins brand-new when the Sky Skooter and ePod get together. The pair will cost a shade over $80,000, which in the light sport aviation world of 2006 represents a pretty good bargain. The Sky Skooter lists for $79,995 and comes with a long list of standard items. You get a scattering of engine instruments (fuel, tachometer, hour meter, oil temp and pressure, CHT, and ammeter) plus basic flight instruments (ASI, altimeter, compass, slip-skid) and a good load of communications gear (760 transceiver radio, intercom, encoding transponder, and ELT). If you order the Dynon EFIS, it replaces the flight instruments but it has even more functions in a compact face. Call the factory for the latest pricing and how you might wish to outfit your own Sky Skooter. IndUS Aviation's ePod runs just under $2,000 with all sensors and all features. This is an impressive instrument that serves more purpose than in-flight information. The Sky Skooter is a genuine Made-in-the-USA airplane with qualities to satisfy discriminating buyers. Catch a flight when you can and see if skooting around the sky is your thing. 1See "Pilot Report - Thorp T-211 Sport E," Ultralight Flying! magazine, August '04. Standard Features Jabiru 2200 4-cylinder engine producing 85 hp accessible by top cowling "hood," electric starter, 760 transceiver, intercom, encoding transponder, ELT, 2-blade Sensenich wood propeller, basic flight and engine instrumentation, fully enclosed cabin with canopy that can be opened in flight, dual joysticks and rudder pedals, 2-position flaps, in-flight trim, panel-mounted choke, convenient fuel shutoff, oleo-strut gear, steerable and suspended nosewheel, single-lever mechanical brakes, ball-bearing control linkages, all-metal wings and tail, shoulder belt pilot restraints, large storage area, map pockets. Options 120-hp Jabiru 3300 engine (on Thorpedo model), IndUS-designed ePod electronic engine measurements instrument (see detail in article), Dynon digital flight instrument, additional flight and navigation instruments and radios, ballistic parachute. Construction All-metal aluminum airframe, special ribbed aluminum wing skins and horizontal tail with limited composite components. Made in the USA by American-owned company (see article for additional detail); distributed by U.S.-owned company. Pros - The Sky Skooter and its increasingly well-accepted Jabiru engine will work for flight schools and sport pilots. 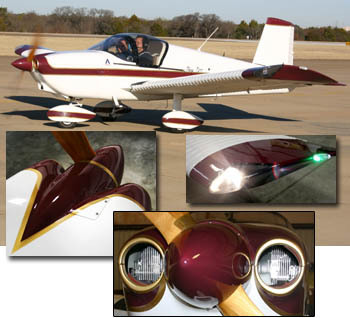 The T-211 is a proven design from a respected designer, John Thorp, whose work lead to the Piper Cherokee. Unique ribbed wing was designed for ease of assembly and improved aerodydnamics. Cons - Modest performance and smaller cabin may limit interest from some buyers (though payload is good). With 85-hp engine, the Sky Skooter is a basic performer. Some potential buyers will view this as an older design despite its modernized electronic instrument panel. Pros - The Sky Skooter appears to be a simple plane (and it is) but still has flaps, trim, and electric starting. Flap lever position gives good leverage for ease of operation. The Sky Skooter is well appointed and most buyers will need few options. The ePod is an easy-to-use electronic instrument with excellent features. Cons - Though the ePod is a very thorough instrument, like all electronic references you'll need to read a manual to get the most out of it. Flaps are not particularly effective surfaces. Single hand brake is common to ultralight pilots though general aviation pilots might not care for it. Right-side occupant cannot see trim. Pros - Comfortable, leather upholstered seats with fully adjustable shoulder and lap belts in the Sky Skooter along with fully finished interior. Dual joystick controls for each seat within easy reach. Large, easily adjusted trim wheel (left of center console). Fuel tank fills from the outside and no interior fumes detected. Cons - Entry means stepping up on a wing and then lowering yourself into a small cockpit, a tougher action for some less flexible occupants. Small interior only an inch wider than a Cessna 150. Seats don't adjust, neither do rudder pedals although thicker or thinner seat cushions take care of this. Large pilots should try it on for size. Pros - Excellent ground maneuverability even without directional braking. Hand brake lever is very accessible for both occupants; lever position affords good grip and pull range. Wide-open visibility for preflight traffic checking. Oleo struts provide suspension for mains and nosewheel. Cons - Single hand brake offers no differential braking (though ground steering is responsive enough that such braking is not needed). I found brakes were not particularly strong at slowing the Sky Skooter on pavement, a problem common to many aircraft, though IndUS feels this is partly related to tire size as the brake can hold the airplane at full throttle. Pros - The Sky Skooter offers simple and straightforward landings. Broad visibility on landing approach and before takeoff. Authoritative controls help on crosswinds operations very straightforward. Slips were reasonably effective. Generous ground clearance. Cons - Landing approaches at 50+ knots (58+ mph) seem a bit fast from an ultralight pilot's perspective. Ground roll was longer and climbout was significantly slower than some ultralight pilots are used to experiencing. Flaps don't help shorten takeoff roll much; I was advised not to bother with them. Pros - Light touch and well-harmonized controls on the Sky Skooter will be appreciated by flight school students and experienced pilots. Handling is very predictable with precision turns to headings easy to do. Linkages are smooth, supported by ball bearing construction. Slow-speed handling is quite good. Cons - No one will call the Sky Skooter's roll rate "brisk" as 45°-to-45° bank alternations were in the 4-second range. Adverse yaw was present; you must make use of the controls to effect a well-coordinated turn (though this is common to many other designs). Pros - The Sky Skooter's slow-speed flying qualities are quite good (though this won't amaze many ultralight pilots). Cruise with Jabiru 2200 engine is modest but acceptable at about 100 mph at 75% power. Slow flight qualities were very predictable. Ground roll is shortened by lower weight than on the Continental-powered T-211 model. Cons - Climb rate is only 690 fpm even with 85 horsepower. Compared to potent 2-stroke engines on many ultralights, the Sky Skooter's Jabiru won't inspire many ultralight pilots. Cruise speeds are modest for the price tag (many ultralight-like aircraft can match the Sky Skooter, though the Sky Skooter may last far longer). Pros - Stalls in all forms were very mild and showed no negative characteristics. Longitudinal stability was what you'd expect for a light sport aircraft built to meet Part 23 certification; disturbing the pitch resulted in level flight again in a short time. Excellent visibility helps overall safety. Cons - Stall speeds are higher than most ultralights (though the lighter Jabiru version is better than the Continental O-200-powered version). When nosed over aggressively, the Sky Skooter can pick up speed rapidly. Adverse yaw, while not significant, is present. Pros - The Sky Skooter may find a ready market in flight school operations. Can be flown with canopy open, a plus for ultralight enthusiasts. Has won Light-Sport Aircraft airworthiness and is on the market as such now. Delightful handling combined with the performance boost from a light Jabiru engine makes for a most enjoyable flying airplane. Cons - The Sky Skooter may resemble a general aviation airplane too much for ultralight pilots (though this configuration may help resale). Design has been around a long time yet not many are flying in the USA. Dealer network and support are still being developed (though general aviation A&P's can do most of what you need). Prices, as with most light sport aircraft, are on the high end for ultralight pilots. he proven airframe and modern panel of the Sky Skooter make perhaps the oddest, yet most appropriate of mates. Each from a different age – the T-211’s unique ribbed wing beckons from the 1940s while the ePod streaks ahead in the 2000s – they nonetheless complement each other. The Sky Skooter is the fun little variant of the T-211 series, including the FAA-certified T-211 and the ASTM standards-compliant (LSA certified) Thorpedo. The company can deliver just about any version of John Thorp’s groundbreaking design, the very one that lead to Piper’s Cherokee, which sold tens of thousands. Complementing the joyful and innocent Sky Skooter with the most pleasant in-flight handling comes the visitor from the future: IndUS Aviation’s ePod. Putting these together for a flight review shows the past and the future of light-sport aviation. Long Perspective The T-211 has a long, rich aviation history. The model dates back to designs studies in the early 1940s that lead to the Lockheed Little Dipper, a single-place light aircraft created by legendary designer John Thorp. 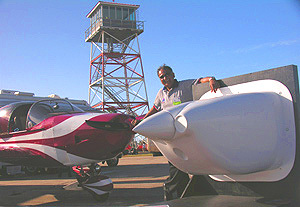 IndUS owner Ram Pattisapu poses beside his Thorpedo with a mockup of the new nose cowl designed for the Dallas-based company by LoPresti Speed Merchants. Read my Thorpedo report. How to extract more performance from a 60-year-old design? How about a nose job? Pilots understand a smoother shape lends more speed to a design, but you may not sense the total gain possible without adding horsepower or burning more fuel. General aviation companies like Mooney, Cessna, and Piper hired LoPresti Speed Merchants to help boost speed. 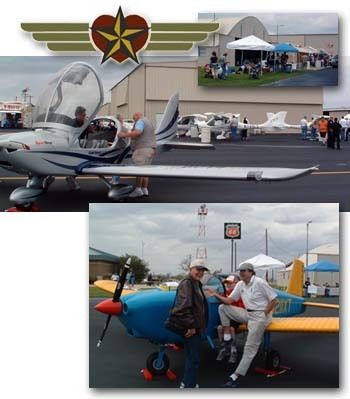 *** At the 2007 Sebring LSA Expo IndUS Aviation revealed a new LoPresti nose cowl for their Thorpedo LP; plus reshaped wing tips which enclose nav and landing lights plus strobes, and new landing gear fairings...which, being Texans, they called "cowboy boots." LoPresti engineers say the streamlined improvements will boost Thorpedo's speed near the LSA limit of 120 knots. A 75% power cruise gain of 20% is forecast. The new components modernize the lines of this venerable John Thorp design from the 1940s, though it may seem hard to improve on a airplane that never required a single Airworthiness Directive! How to extract more performance from a 60-year-old design? How about a nose job? Pilots understand a smoother shape lends more speed to a design, but you may not sense the total gain possible without adding horsepower or burning more fuel. 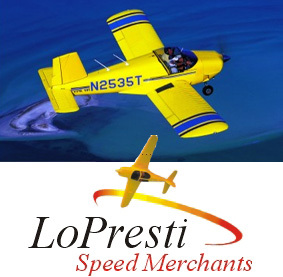 General aviation companies like Mooney, Cessna, and Piper hired LoPresti Speed Merchants to help boost speed. *** At the 2007 Sebring LSA Expo IndUS Aviation revealed a new LoPresti nose cowl for their Thorpedo LP; plus reshaped wing tips which enclose nav and landing lights plus strobes, and new landing gear fairings…which, being Texans, they called “cowboy boots.” LoPresti engineers say the streamlined improvements will boost Thorpedo’s speed near the LSA limit of 120 knots. A 75% power cruise gain of 20% is forecast. The new components modernize the lines of this venerable John Thorp design from the 1940s, though it may seem hard to improve on a airplane that never required a single Airworthiness Directive! Thorpedo with the Jabiru 3300 (120-hp) engine has been a good performer, but now, thanks to changes offered by engineers from LoPresti Speed Merchants, cruise could jump 20 knots says IndUS. One sign that Light-Sport Aircraft have arrived is when a well-known general aviation company joins forces with a LSA leader. That's what occurred when IndUS Aviation, producer of the Thorpedo and Sky Skooter, retained Vero Beach, Florida-based LoPresti Speed Merchants. You surely know the legendary Roy LoPresti operation that gained fame by working with major airframe builders to extract more speed from their designs. Though Roy died last August, the company continues its "brain trust" work to squeeze speed from an airplane without adding horsepower. Those speed mods are now going to quicken the cruise of a new Thorpedo LP. At the Sebring LSA Expo in just four days, you can get first-hand info on components that will make a new, faster Thorpedo. *** You may also want to ask the IndUS folks why FAA Administrator Marion Blakey paid a three-hour visit to their operation in India. Mostly, LSA seem to come from across the Atlantic to the U.S. but IndUS President Ram Pattisapu has been working to make sales go both directions. One sign that Light-Sport Aircraft have arrived is when a well-known general aviation company joins forces with a LSA leader. That’s what occurred when IndUS Aviation, producer of the Thorpedo and Sky Skooter, retained Vero Beach, Florida-based LoPresti Speed Merchants. You surely know the legendary Roy LoPresti operation that gained fame by working with major airframe builders to extract more speed from their designs. Though Roy died last August, the company continues its “brain trust” work to squeeze speed from an airplane without adding horsepower. Those speed mods are now going to quicken the cruise of a new Thorpedo LP. At the Sebring LSA Expo in just four days, you can get first-hand info on components that will make a new, faster Thorpedo. *** You may also want to ask the IndUS folks why FAA Administrator Marion Blakey paid a three-hour visit to their operation in India. Sky Skooter's great economy may help IndUS penetrate the developing market in India. IndUS boss, Ram Pattisapu, travels frequently to build the company's second base in Bangalore. Email IndUS. Read my T-211 report. Dallas, Texas-based IndUS Aviation earned their second SLSA model approval with certification of the T-11 Sky Skooter. Powered by the four cylinder, 85-hp Jabiru 2200, Sky Skooter becomes the lighter sibling to the potent Thorpedo, which uses the 120-hp Jabiru 3300 on the same airframe. Compared to IndUS's T-211 with the Continental O-200 engine, the smaller Jabiru saves 100 pounds. Fuel burn is stated as 4 gph at economy cruise. At the design's birth in 1944, Sky Skooter was designed around a 50-hp Franklin engine. With the lighter engine, the 2006 Sky Skooter tips the scales at a modest "645 pounds empty," commented Ram Pattisapu, owner of IndUS. That is less than most Light-Sport Aircraft and brings pleasant handling as I found in a short flight in the prototype Sky Skooter. I find it refreshing to see a company use a smaller powerplant and simpler aircraft. But I ask the same question as with the Skykits Savannah ADV: Is Sky Skooter a "new" model for our SLSA List? Dallas, Texas-based IndUS Aviation earned their second SLSA model approval with certification of the T-11 Sky Skooter. Powered by the four cylinder, 85-hp Jabiru 2200, Sky Skooter becomes the lighter sibling to the potent Thorpedo, which uses the 120-hp Jabiru 3300 on the same airframe. Compared to IndUS’s T-211 with the Continental O-200 engine, the smaller Jabiru saves 100 pounds. Fuel burn is stated as 4 gph at economy cruise. At the design’s birth in 1944, Sky Skooter was designed around a 50-hp Franklin engine. With the lighter engine, the 2006 Sky Skooter tips the scales at a modest “645 pounds empty,” commented Ram Pattisapu, owner of IndUS. That is less than most Light-Sport Aircraft and brings pleasant handling as I found in a short flight in the prototype Sky Skooter. I find it refreshing to see a company use a smaller powerplant and simpler aircraft. But I ask the same question as with the Skykits Savannah ADV: Is Sky Skooter a “new” model for our SLSA List? IndUS Aviation president Ram Pattisapu offers a few last words of advice to Preston Bentley before he takes a company-donated Thorpedo on an 8,000-mile tour billed as the first LSA flight to land in 48 states in 30 days. Contact Preston. Preston Bentley had a plan. He wanted to honor a good friend, raise money for a worthy charity, and do plenty of Light-Sport Aircraft flying. The 26-year-old Private Pilot is presently 12 days into an 8,000-mile flight. Preston is flying a Thorpedo donated by IndUS Aviation; he expects to touch down in each of the lower 48 states in 30 days. Bentley seeks to raise $500,000 for Ronald McDonald House Charities of Greater Cincinnati in the memory of his cousin Seth Bailey, who died in April 2004. The flight's progress can be followed via an online blog. *** After my spring mishap my wife benefitted from the Quantum House in Florida where I was hospitalized. This was far better than other lodging alternatives as it offered a support group in addition to living quarters. Some 259 Ronald McDonald Houses do likewise and I understand how important these places are to families of those receiving medical care. Preston is a motivated young pilot who certainly picked a beautiful time of year to see the USA by LSA. Preston Bentley had a plan. He wanted to honor a good friend, raise money for a worthy charity, and do plenty of Light-Sport Aircraft flying. The 26-year-old Private Pilot is presently 12 days into an 8,000-mile flight. Preston is flying a Thorpedo donated by IndUS Aviation; he expects to touch down in each of the lower 48 states in 30 days. Bentley seeks to raise $500,000 for Ronald McDonald House Charities of Greater Cincinnati in the memory of his cousin Seth Bailey, who died in April 2004. The flight’s progress can be followed via an online blog. *** After my spring mishap my wife benefitted from the Quantum House in Florida where I was hospitalized. This was far better than other lodging alternatives as it offered a support group in addition to living quarters. Some 259 Ronald McDonald Houses do likewise and I understand how important these places are to families of those receiving medical care. IndUS Aviation's Hot Thorpedo performs more energetically than the Continental-powered version. When you install a non-certified Jabiru 3300, six-cylinder engine into a 58-year-old certified light aircraft, you make one lively machine out of it. This relatively new company is doing things for this CAR 3-certified aircraft that legendary designer John Thorp could never do (for one, he didn't have the Australian Jabiru powerplant). EAA's Sport Pilot magazine (2/05) will have a full pilot report on Thorpedo. Look for it here 90+ days after publication. IndUS Aviation’s Hot Thorpedo performs more energetically than the Continental-powered version. When you install a non-certified Jabiru 3300, six-cylinder engine into a 58-year-old certified light aircraft, you make one lively machine out of it. This relatively new company is doing things for this CAR 3-certified aircraft that legendary designer John Thorp could never do (for one, he didn’t have the Australian Jabiru powerplant). 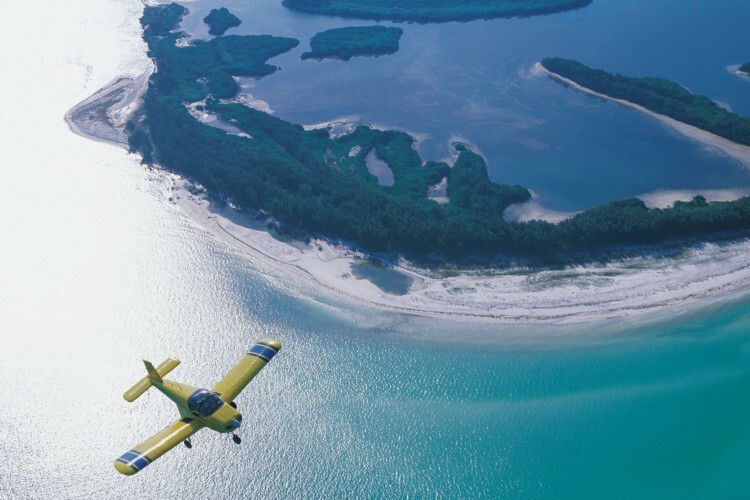 EAA’s Sport Pilot magazine (2/05) will have a full pilot report on Thorpedo. Look for it here 90+ days after publication. A closer look at the engine installation of the six-cylinder Jabiru 3300 that puts out 120 hp and makes the T-211 a lively performer. 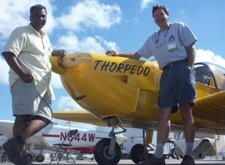 Ram Pattisapu and Scott Severen from IndUS Aviation flank the new Jabirupowered Thorpedo. IndUS Aviation is pleased with the Jabiru 3300 installation in the Thorp T-211. It may be a certificated (standard category) aircraft, but the Thorp T-211/ Thorpedo can open its canopy in flight for ultralight-type flying. Your car has one. Why not your airplane? A hood allows access for better inspections and maintenance. As the original equipment tag proves, this Sky Skooter was serial number 1 of the T-211 line. All Revved and Everywhere to Go This vintage design with a big Jabiru engine is an impressive performer. Since its reintroduction to the aviation community by IndUS Aviation, John Thorp's T-211 is generating more attention than at any time since he first designed the airplane. While John worked on large aircraft, like the Navy patrol bomber P2V Neptune, he focused most of his career on small, sporty aircraft. He began designing a two-place light aircraft in the 1930s. By the 1950s his T-10 Sky Skooter powered by a 50-hp Franklin 2AC-99 engine evolved into the T-111 with a 75-hp Lycoming engine. Later it became the T-211, with a Continental O-200. It is this last version of the T-211 that IndUS now offers as a standard category aircraft. IndUS is also planning to offer the model as a light-sport aircraft (LSA) with a Jabiru 3300 engine, affectionately named the Thorpedo for its improved performance. The T-211 was actually the design predecessor to the Piper Cherokee, which has gone on to have an amazing success story. However, the attractive little twoseat T-211 didn't fare well on its own. The design went through several ownership changes, the last of which saw it leave the United States for England. None of these ventures were particularly successful, and the T-211 languished. 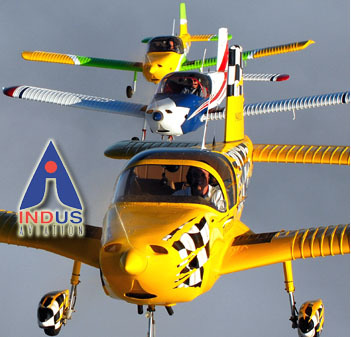 IndUS Aviation Good news for the design arrived by way of Ram Pattisapu and IndUS Aviation based in Dallas, Texas. Ram is Indian by birth, but has lived in the United States for nearly 35 years. He was a surgeon for many years and owned several aircraft, but the siren's call of aviation as a business opportunity caught his attention, and Ram traded his stethoscope and charts for a headset and logbook. Ram has struck a manufacturing deal with Taneja Aerospace and Aviation Limited (TAAL) to produce the T-211. Located in India, TAAL offers manufacturing cost advantages and opens the door to sales in the second most populated country on Earth. Ram has plans for an aviation showroom in India, and he attended the Aero India 2005 show in February to stimulate interest. Two certificated T-211s have already been fully produced in India. While we may think of India as a poor country, many entrepreneurs, businesspeople, and government agencies in that country are prospects for the T-211. To make sure the T-211 will fully meet LSA requirements, Ram has attended nearly every ASTM consensus standards development meeting. 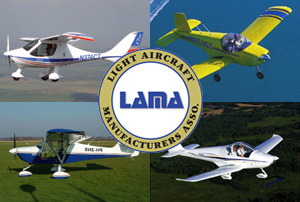 (Recall that special LSA and experimental LSA, other than transitioning ultralights, must be built and maintained according to the FAA-mandated consensus standards.) The T-211 will have few problems meeting those requirements, as it's already certificated to CAR 3 standards with the O-200 engine, but to accommodate alterations such as the installation of the Jabiru engine, LSA approval will be necessary for those who want fully built special LSAs. Scott Severen, formerly the CEO of TEAM Aircraft of miniMAX fame, is the company's sales and marketing director. A hang glider pilot who also flies ultralights and general aviation aircraft, Scott brings a wealth of aviation experience to the IndUS Aviation team. A Tale of Two Pilots One of the beauties of the sport pilot rule is the variety of aircraft that a sport pilot can fly. However, the many choices complicate the decision-making process. At the U.S. 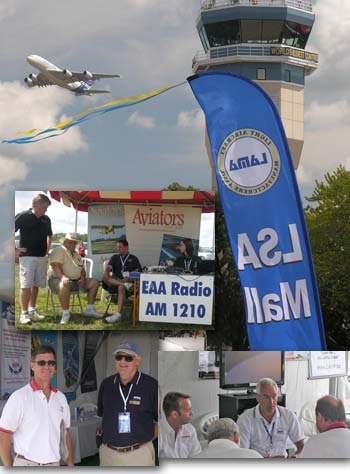 Sport Aviation Expo held in Sebring, Florida, in late October, I made a couple of presentations on what to consider when buying an LSA. While my first session early in the weekend was nearly full, only two pilots attended my end-of-event talk. Rather than run my usual computer presentation, the two men and I visited informally. We talked about their aviation backgrounds- both had been general aviation (GA) pilots, and each had some experience with ultralights and liked the low-and-slow experience these aircraft represent. Each was an older gentleman (that is, a few years older than me! ), and while neither currently had trouble maintaining their airman's medical, they both realized the future might be different, so flying a sport pilot-eligible aircraft was important to them. We talked about many light aircraft, discussing performance, cost, design background, entry and exit, longevity, maintenance, and a raft of personal preferences. As we neared the end of my one-hour time slot, it was clear that both these men were ripe candidates for the Thorp T-211. Both were intrigued by the Thorpedo, with its extra power and performance, but if they go the T-211 route, they'll likely each end up with the Continental-powered T-211 as it retains its CAR 3 certification (the predecessor to FAR Part 23). While these men don't represent the only candidates for a Thorpedo or T-211, they do show that this aircraft is one that can satisfy a variety of interests and demands. For example, I like open-cockpit flying. I like to smell the air and feel the warm breezes|in the right climates. However, other pilots don't like the wind or the noise of an open cockpit. The T-211/Thorpedo lets you go both ways. The canopy can be opened or closed any time in flight. I actually found it easier to close than to open, though both are one-handed operations. Meet the Thorpedo At the U.S. Sport Aviation Expo, I had the opportunity to fly the Jabirupowered Thorpedo. For the first time in our 20 years of acquaintance, Scott and I were able to occupy the same cockpit as he joined me on this test flight. In an earlier T-211 flight behind a Continental O-200, I found the takeoff roll long and the climb rate rather uninspiring. Many GA pilots may not see it the same way because they may be used to tamer performance, but I prefer ultralights and LSAs that like to jump off the ground. The Thorpedo with the sixcylinder, 120-hp Jabiru 3300 gave me a whole new impression of the design. It enthusiastically leaves the ground in only 350 feet of roll and can climb better than 1,000 fpm. I measured a climb rate over a three-minute window on a day with 85°F temperatures near sea level. The Thorpedo averaged 833 fpm with an initial climb rate better than 1,000 fpm. We achieved this at about 100 pounds under the maximum gross of 1,270 pounds, Scott calculated. The big Jabiru engine ran smoothly, suggesting that IndUS mechanics have done a good job with the installation of this engine, but it also speaks to the design of the Australian-built engine. The Jabiru 3300 likes to run at 2700 rpm; however, prop choice is always a factor in such a number. Maximum continuous revolution is 3100, and the prop on the Thorpedo that I flew in Sebring had a fairly aggressive pitch. IndUS Aviation has since changed the pitch and is now getting a higher prop speed, resulting in improved climb and cruise. The Jabiru USA representatives say that the engine prefers to run in the 2700-rpm range or higher. Yet without referring to the tachometer, I naturally gravitated to about 2500 rpm as I listened to the engine. Scott said that setting offers an economical flying speed, burning about 4.5 gph and "never more than 7 gph." Given the aircraft's 21-gallon fuel tanks-the same as a Cessna 150-the Thorpedo can run longer than four hours, during which time it can cover around 500 miles. Even with the throttle firewalled, the Thorpedo can stay aloft for three hours, covering almost the same distance in less time. Maximum full-power, level flight speed was a few notches slower than 130 mph (about 113 knots). IndUS believes it can coax a bit more speed from the Thorpedo. Scott said IndUS might push the design to 120 knots, the speed limit under the SP/LSA rule. An obvious way to achieve this would be the addition of wheelpants to reduce drag, but a more subtle solution that will achieve beneficial results involves adding a small fairing at the trailing end of the canopy where an inch gap generates a bit of drag. The plane stalls at just faster than 50 mph, achieving a respectable speed range with a 2.5-to-1 low-to-high speed ratio. Sky Skootin' Sweetheart The Thorpedo's performance numbers are fine, but a more subjective quality of any airplane is its handling. In this area, the Thorpedo has few peers. In every flight maneuver I practiced, the plane was well behaved. Dutch roll coordination exercises, turns to headings, and climbing or descending turns all were highly predictable. Experts and novices alike will be assured by the surefooted ways of the T-211. The Thorpedo did nice steep turns. I performed 60-degree steep turns and found it easy to keep the ball coordinated. Not much back stick was required to hold altitude. Adverse yaw was minimal for the required stick inputs. As we left cruise altitude, I measured the descent rate at 700 fpm over a twominute timed descent. Returning to the Sebring Regional Airport for some touch-and-goes, I tended to fly the Thorpedo too much like an ultralight. I raised the nose too high on the flare-out and ended up plopping the airplane on the ground two out of three times. Most of this was caused by a lack of familiarity with the airplane and some personal preference for high-wing landing characteristics. Regardless of my clumsiness, the gear absorbed the load as though it were nothing. 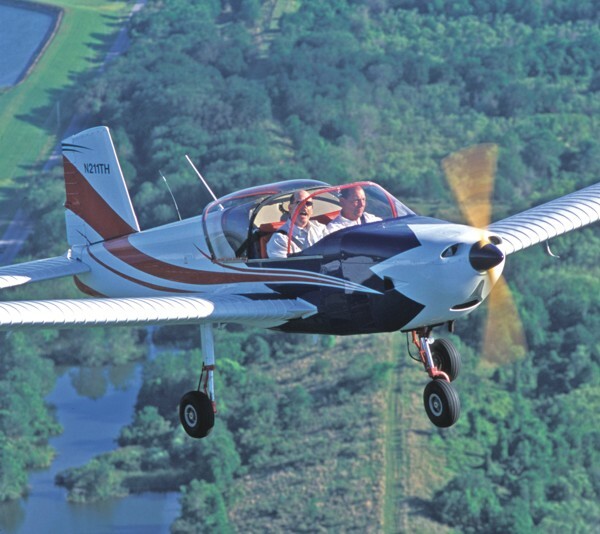 Instructors will love this airplane as much as their students do. On our first go-around, as we retracted flaps-which you hardly need for landing or takeoff-rotation behind the Jabiru 3300 came at 50 knots indicated airspeed (IAS). Coming back in for my second touch-and-go, Scott advised me not to approach slower than 70 knots. This provides an extra margin of energy when you get low over the runway. Sure enough, my touchdowns improved. I'd been flying too slowly earlier. The best landing technique in this aircraft is to approach at 80 knots (92 mph), slow to 70 knots (81 mph) on short final, and drop the speed to less than 52 knots (60 mph) as appropriate over the runway. All this has little to do with the engine and more to do with the wing design. At 12-pounds-persquare- foot wing loading, the Thorpedo is substantially more heavily loaded than the lightest ultralights. Standard Category or LSA The T-211 is a standard category design with full FAA certification under the CAR 3 program of the 1940s and '50s. When delivered as a certificated aircraft, the T-211 must be powered by a 100-hp Continental engine. As a CAR 3-certificated aircraft, it can be compared to an Aeronca Chief, which has a nearly identical gross weight. However, comparing the Thorpedo to the Chief shows some significant differences. The Thorpedo has 20 extra horses and weighs 150 pounds less, causing it to perform better yet not use more fuel. The Chief climbs at a little faster than 400 fpm, as does the T-211 with the same engine, while the Thorpedo can climb more than twice as fast. The Chief may be available at lower prices, but you have to be careful not to buy an older airplane with a problem history. With a Thorpedo, the plane will be brand new. Maintenance differences also separate the three aircraft. The certificated T-211 and Aeronca Chief remain standard category aircraft; therefore, the annual inspection must be conducted by an airframe and powerplant (A&P) mechanic. Because the Thorpedo uses the not-certificated Jabiru engine, it must, at present, be built as an amateurbuilt aircraft (that is, from a 51-percent kit). In that scenario the builder can obtain a repairman's certificate and do the annual condition inspection. After the FAA issues its Notice of Availability (NOA) for the ASTM consensus standards, Thorpedo will be available as an LSA either as an experimental LSA (E-LSA)-that is, a more-than-51- percent complete kit-or as a ready-tofly special LSA (S-LSA). 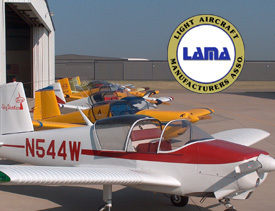 Assembled as an E-LSA, the owner/builder can obtain a light-sport repairman's certificate with an inspection rating after attending a 16-hour course. 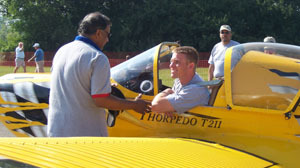 Sold as an S-LSA, the Thorpedo must be inspected by a lightsport repairman with a maintenance rating (acquired by attending an 120- hour course). You can build the Thorpedo as a 51-percent kit under IndUS Aviation's Rapid Fire Program and get into the air in a new airplane for about $66,000, with engine, prop, instruments, paint, and interior. Upcoming price changes will reflect a longer equipment list, but the company currently has special offers it would like to present. A Thorpedo S-LSA is expected to cost about $80,000, said IndUS Aviation, while the Continental-powered certificated T-211 will sell for $96,000. In my mind, the $16,000 savings with the S-LSA version provides a more enjoyable airplane. Choose from the 51-percent kit, an E-LSA, S-LSA, or the standard category T-211-any one will make you happy, and the wide price range of these models will help the plane fit many budgets. That's what makes this aircraft so interesting; you can get exactly what you want. Even though it's a 50-year-old design, it's a sweet and enjoyable plane to fly. All Revved and Everywhere to Go This vintage design with a big Jabiru engine is an impressive performer. Since its reintroduction to the aviation community by IndUS Aviation, John Thorp’s T-211 is generating more attention than at any time since he first designed the airplane. While John worked on large aircraft, like the Navy patrol bomber P2V Neptune, he focused most of his career on small, sporty aircraft. He began designing a two-place light aircraft in the 1930s. By the 1950s his T-10 Sky Skooter powered by a 50-hp Franklin 2AC-99 engine evolved into the T-111 with a 75-hp Lycoming engine. Later it became the T-211, with a Continental O-200. It is this last version of the T-211 that IndUS now offers as a standard category aircraft. IndUS is also planning to offer the model as a light-sport aircraft (LSA) with a Jabiru 3300 engine, affectionately named the Thorpedo for its improved performance.